The F8 is made for serious filmmakers and sound designers. 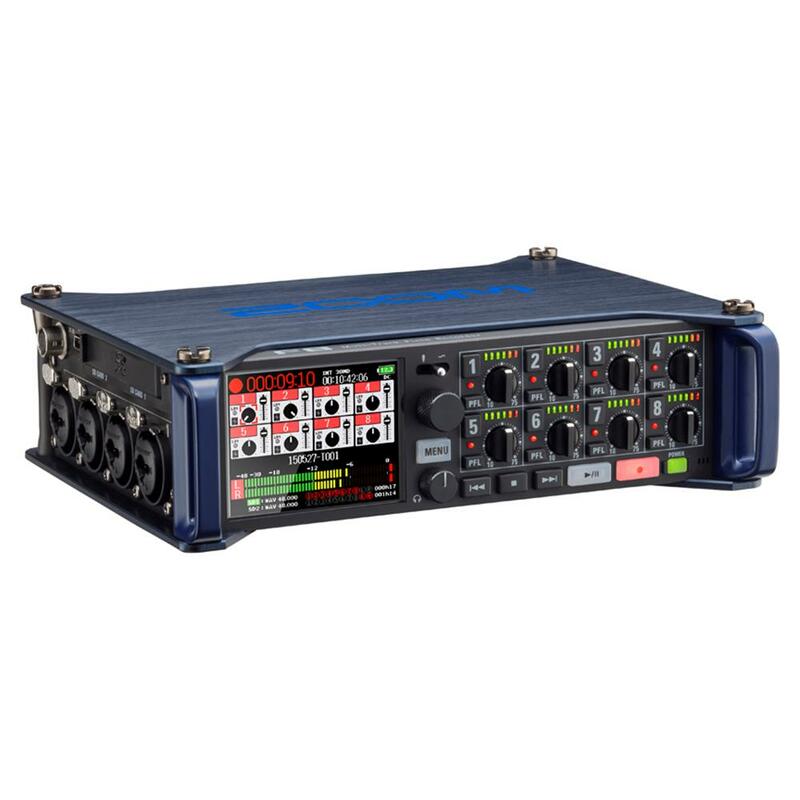 With 8-input/10-track recording, super low-noise preamps, and support for 24-bit/192kHz audio, the F8 captures the highest-quality audio. 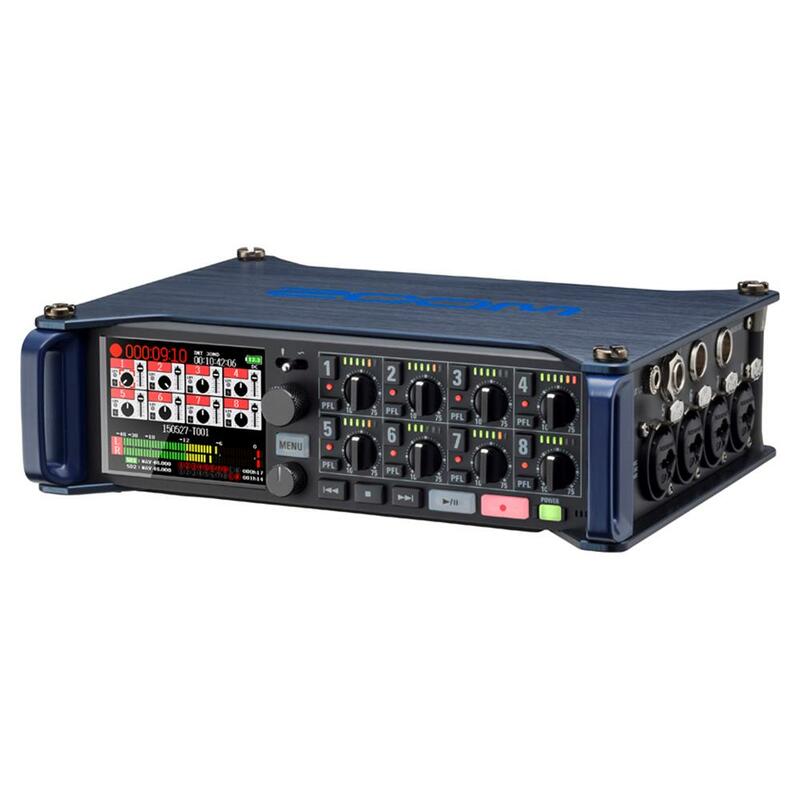 Outfitted with our finest mic preamps to date, the F8 features an extremely low noise floor (-127 dBu EIN) and high gain (up to 75 dB), with +4 dB line inputs. The F8's time code is state-of-the-art. 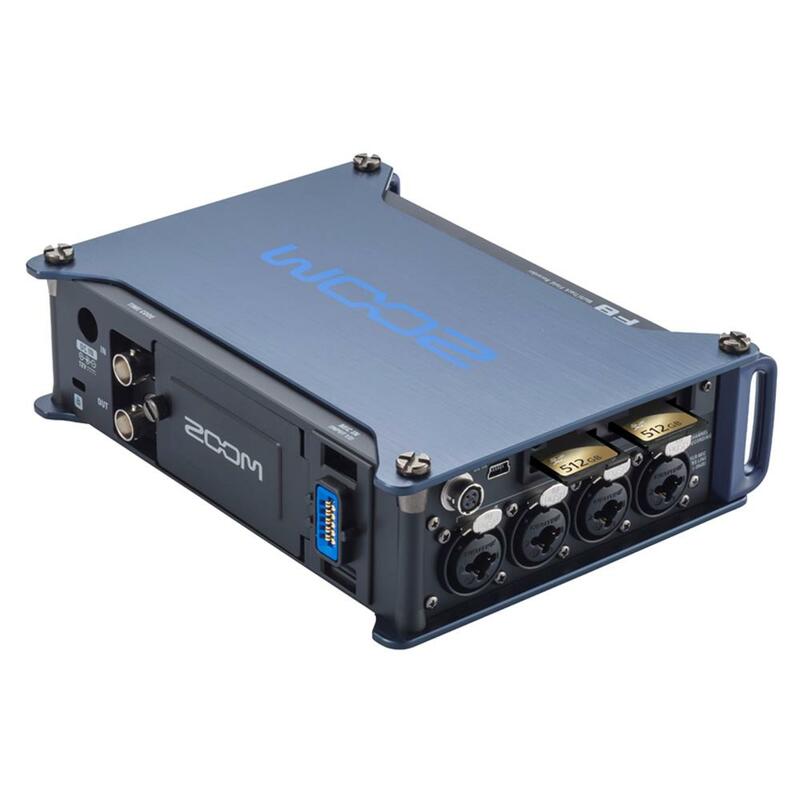 It utilizes a precision oscillator that generates time code at 0.2 ppm accuracy, enabling rock solid syncing of audio and video. Sound professionals sometimes work in dusty, hard-to-see environments. Level meters with adjustable brightness and its 2.4 inch full-color backlit LCD (which can be set to monochrome mode), make the F8 easy to use in any environment - from low-light to direct sunlight. 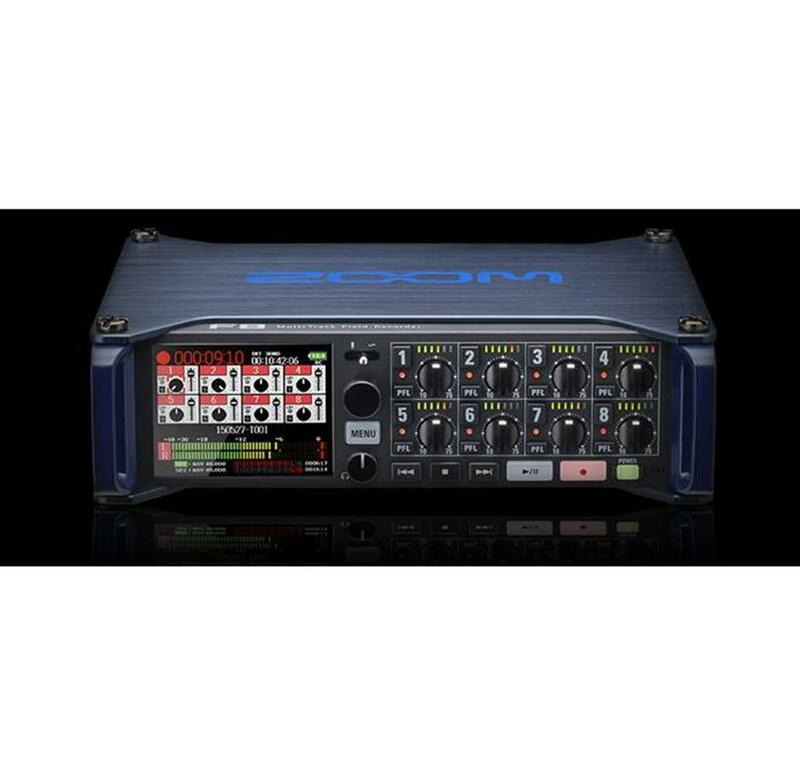 10 tracks - 8 input channels, plus a stereo mix track* - allow you to simultaneously record stereo and surround sound. Out in the field, it's important to be able to quickly check levels as you're recording. With the F8, it's simple. A single display lets you monitor single or multiple tracks, as well as any of the Main or Sub outputs, via a dedicated 1/4 in. headphone jack with a front panel volume control. 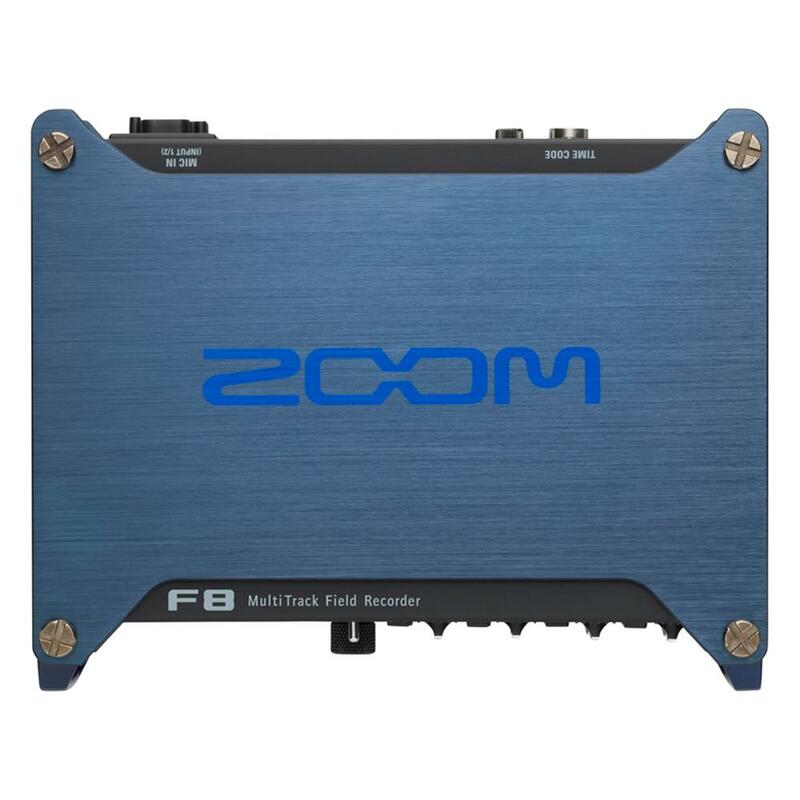 The Zoom F8 Control App for iOS provides extensive wireless remote control of the F8 from your iPhone, iPad, or iPod Touch (5th Gen) using Bluetooth LE protocol. 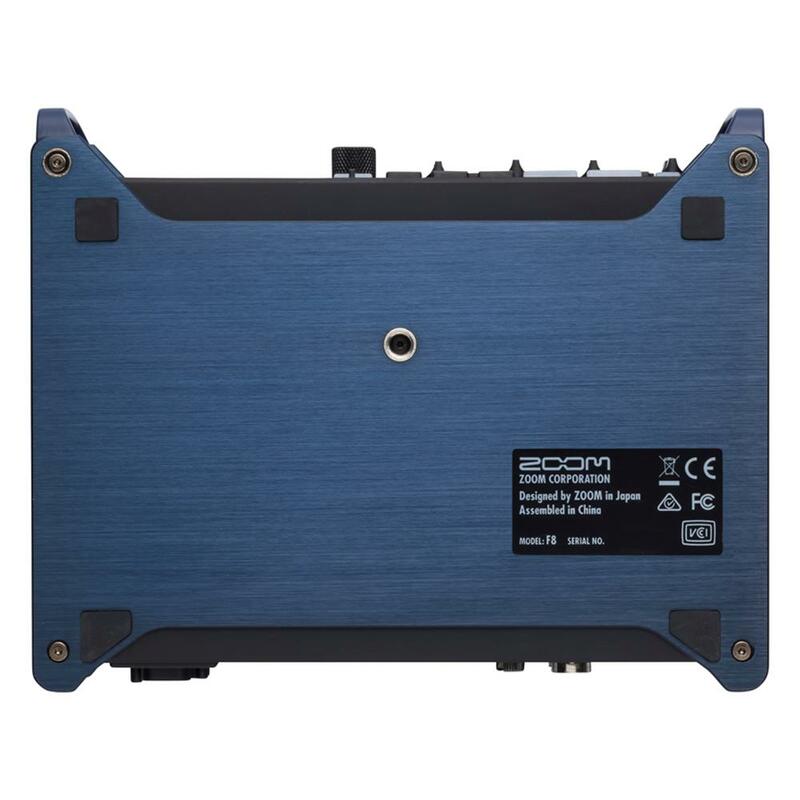 Functions include Record, Play, Stop, Fast-Forward, and Rewind, plus mixer pan and fader level. You can also monitor input levels, current time code, and battery status. With Zoom F8 Control, you can rename files, enter metadata, and set date/time information directly from your iOS device. 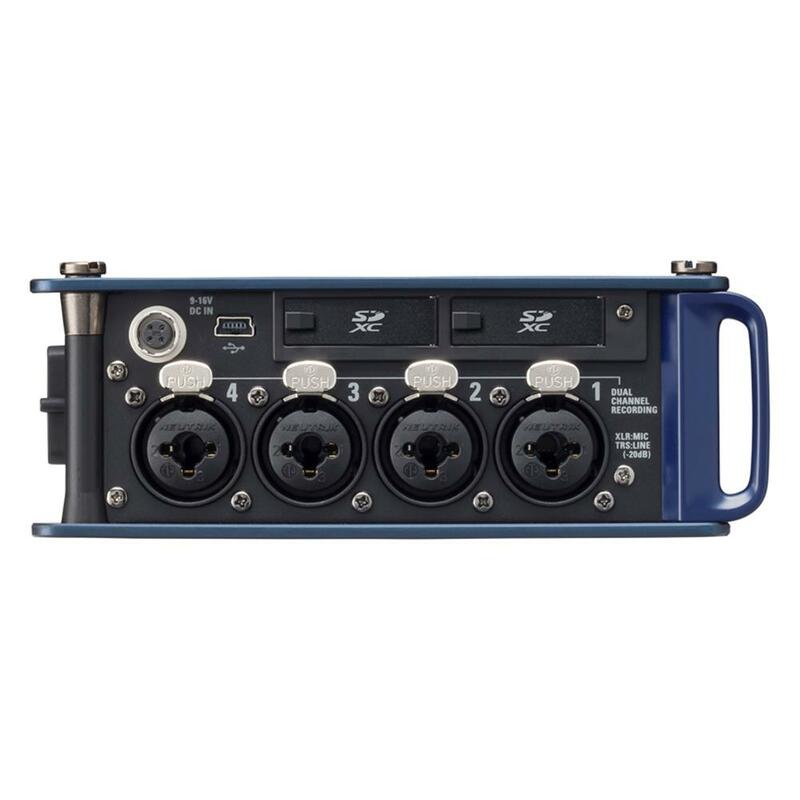 The F8 provides 8 discrete inputs with locking Neutrik XLR/TRS combo connectors. Each input has a dedicated gain control knob, a 6-segment LED level meter, and Record Ready and PFL switch. 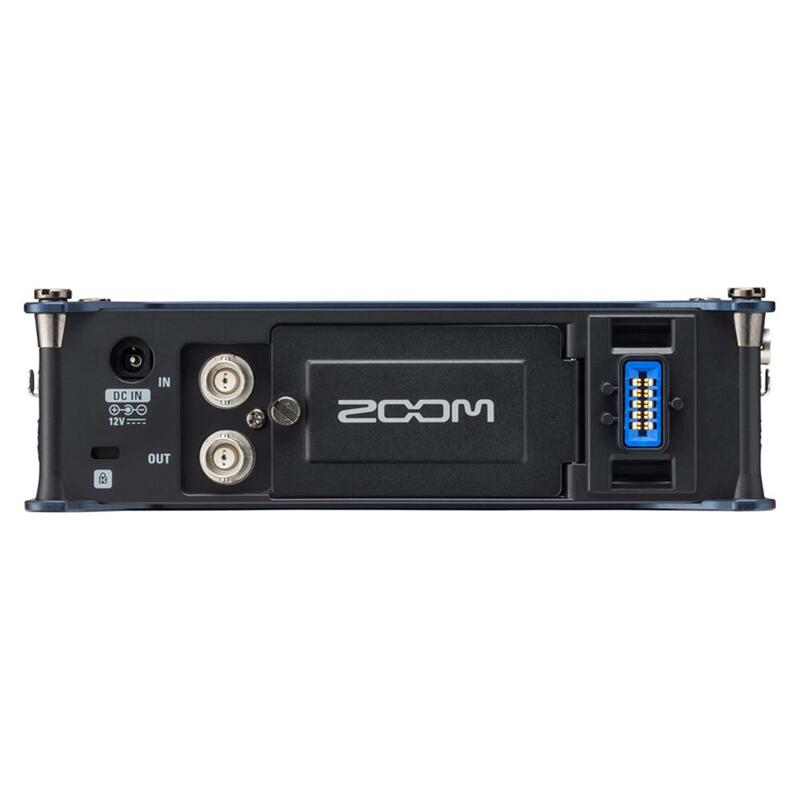 A 10-pin connector on the rear panel enables the use of Zoom mic capsules, with an optional extension cable that allows for remote positioning. There's also a built-in slate mic and a variable frequency slate tone generator to confirm levels. In addition to its 1/4 in. 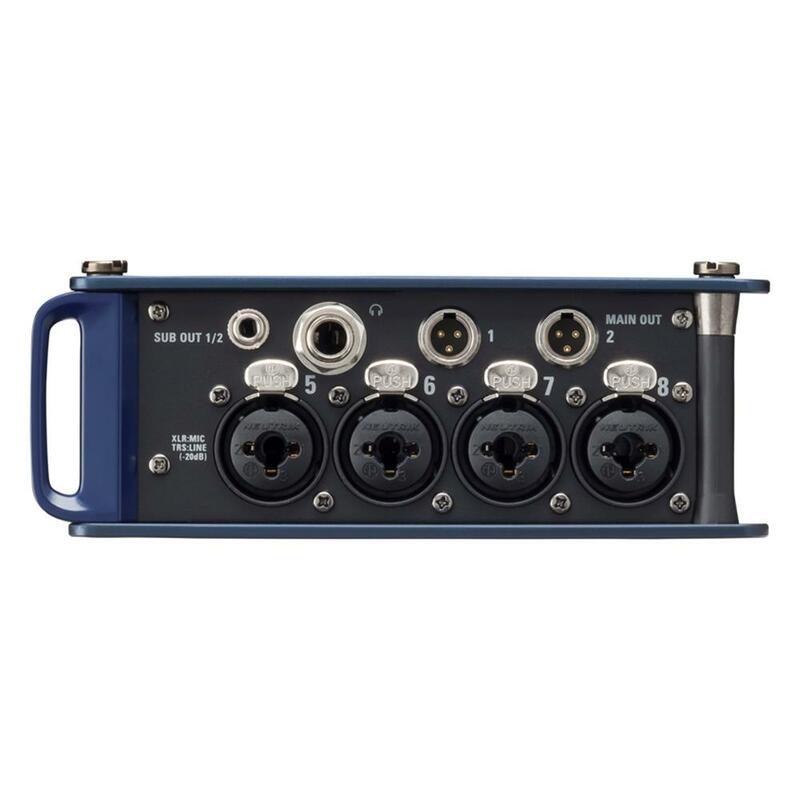 headphone jack with dedicated volume control, the F8 provides four outputs: two Main Outs (on balanced TA3 mini-XLR jacks) for connection to external mixers and processing devices; and two Sub Outs (on a single unbalanced 1/8 in. 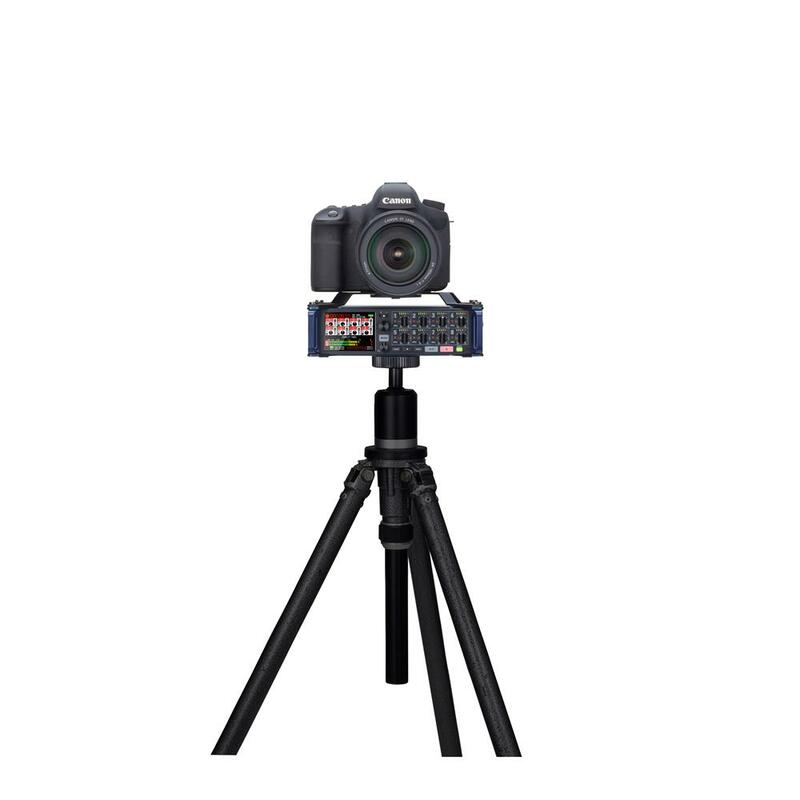 stereo mini-jack) for connection to a camera. The F8's menu is easy to navigate and has a simple file structure. Cataloging is straightforward, with extensive metadata (both BWF and iXML), which can be entered directly on the F8 or with the Zoom F8 Control App.